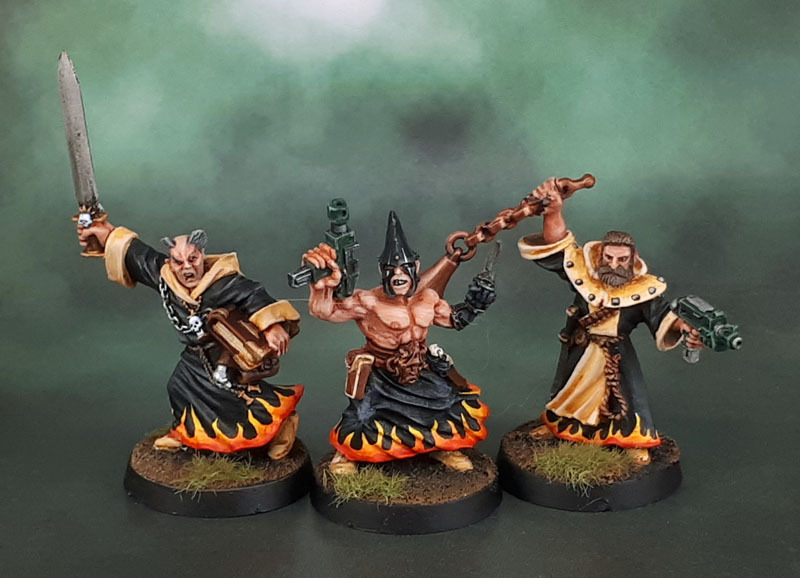 Chaos Cultists | Azazel's Bitz Box. 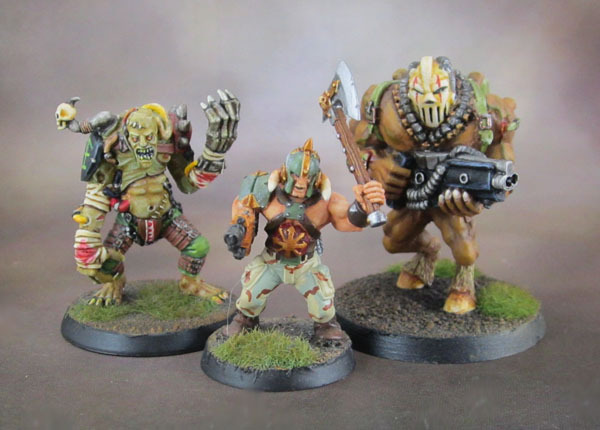 As a followup to both of these posts that featured WarZone 1e Dark Legion Demnogonis (WarZone’s version of Nurgle) models, I’ve gotten off my arse and painted these four, that I found and photographed as a post-script to that last post. I actually found them next to my light box, where I’d left them and forgotten about them months ago. 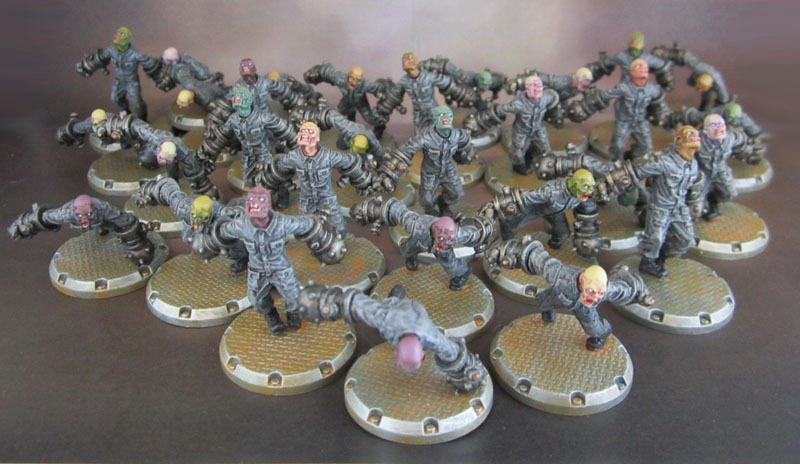 WarZone 1st Edition Dark Legion Zombies. Once again, they painted up damned quickly – within a day and a half from start to finished, most of which was drying time and time spent playing with my PlayStation. As with the previous post’s Black Númenórean Warriors, there’s not a lot to say about showing more figures from a range I’ve painted and shown off before, painted pretty much in the exact same manner. I’ll have the other seven, more military-themed ones done soon(er or later). The Auscam that I plan to give them will make it all take a bit longer, no doubt. Once all are done I’ll probably do another group shot of sci-fi zombies. And then more again when I bust out the plastic Mantic ones. Bloody zombies never end…. 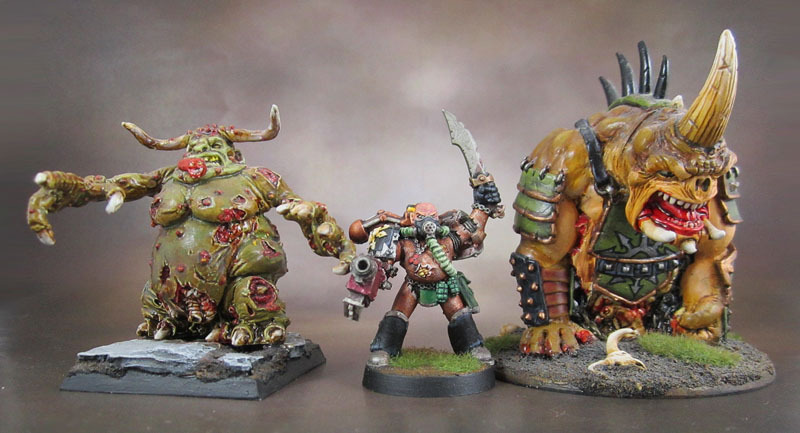 These guys provide the final set of newly-shared figures (for now) of my Nurgle Lost & Damned force. With a bit of luck, I’ll be able to get a fair few more painted up before too long. 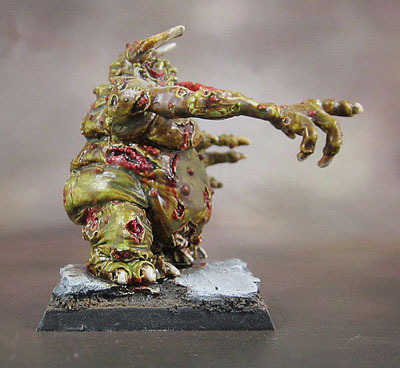 The Original Great Unclean One of Nurgle. I want YOU! For Papa Nurgle. 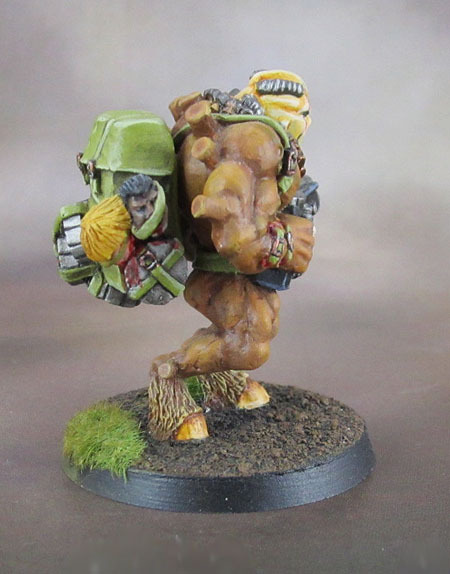 I bought this figure back in the Realm of Chaos days, and started painting him not long after in the browny green olive tone above. Unfortunately, I stalled out for whatever reason and it took over a decade before I’d get back to him to finish off. I did so about 4-5 years ago now, and did so with a combination of The Dip and normal highlighting and shading. Basically, I wanted him to look properly disgusting, which seems to have worked decently well. 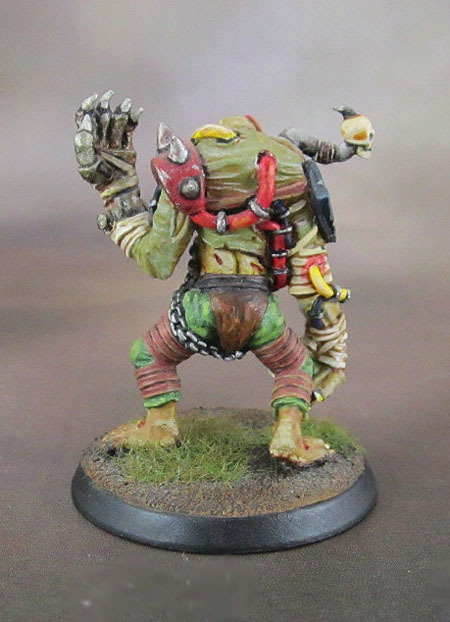 Nurgle’s Twerk! And some dripping behind him. I might have another one of these somewhere with different components – I’m not 100% sure. I do have the later one that came out in the mid-90’s, though I have the early version with the horns and prehensile tail. I also have a FW one here as well, though neither are painted, and it’ll probably be at least a while before their numbers come up. 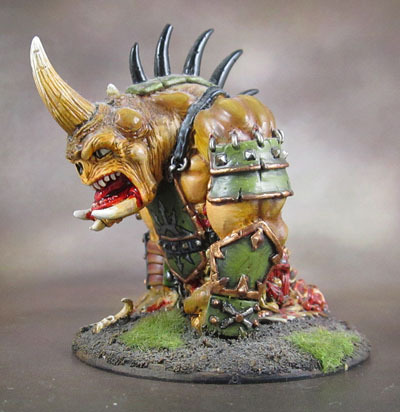 Chronopia’s Devout Tormented – As a Daemon Prince of Nurgle. This big dude is probably unfamiliar to most readers. It’s a Devout Tormented from the Chronopia line of the mid-late 1990’s. Chronopia was essentially Heartbreaker’s take on Fantasy Skirmish following on from the Success of WarZone. Unfortunately, with the fall of Heartbreaker, both games fell. WarZone has had several resurrections over the years, but Chronopia has sunk into the dust, mostly forgotten. Tormented Daemon Prince of Nurgle. I had this model sitting around for quite some time before I decided to use him as part of The Lost and The Damned. As is often the case, the idea behind him is for multiple use. He can play the part of a Chaos Spawn when needed, but also fill the role of a Daemon Prince of Nurgle. He’s a good size, and is much more of a unique model than the usual Daemon wearing Space Marine armour. I’ve got a couple of those to build one day as well, but it’s nice to have something very different as well. Obviously the sculpt has some Nurgle-friendly elements. Being torn in half and still draging himself along the ground like a Zombie Crawler is one thing, and the large mono-horn ties in strongly with the Plaguebearers. As such, he can also fit in with my eventual “proper” 40k Daemon army, and in my Kings of War Abyssal (Daemon) Army (of Nurgle). The two will be mostly the same figures dual-purposed, as you do. 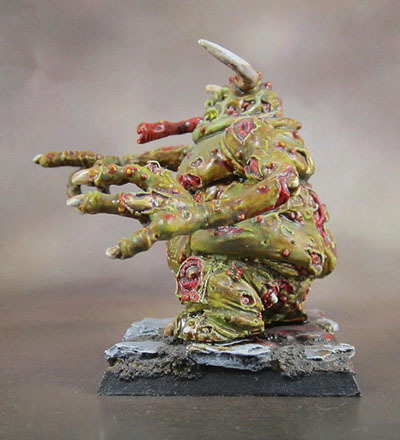 Tormented Daemon Prince of Nurgle – Dismembered! 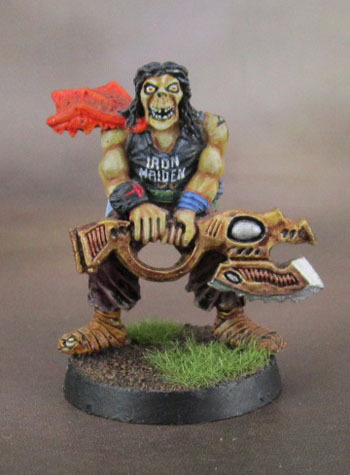 Shortly after painting the “Gym Cultists”, I painted this guy. 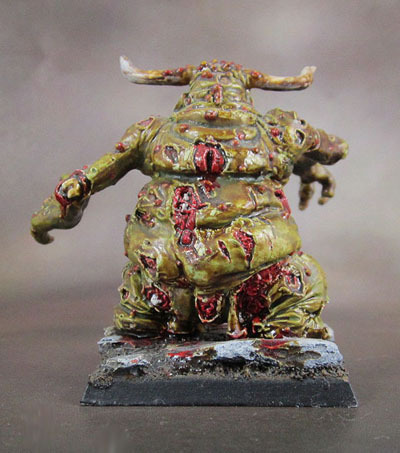 I used a similar palette to tie him in with them, and used “The Dip” via brush on his exposed viscera and dismembered sections, to tie him in with the Great Unclean One. It hasn;t come out well in the photo above, but the back of the base shows a trail of blood and general disgustingness behind him. 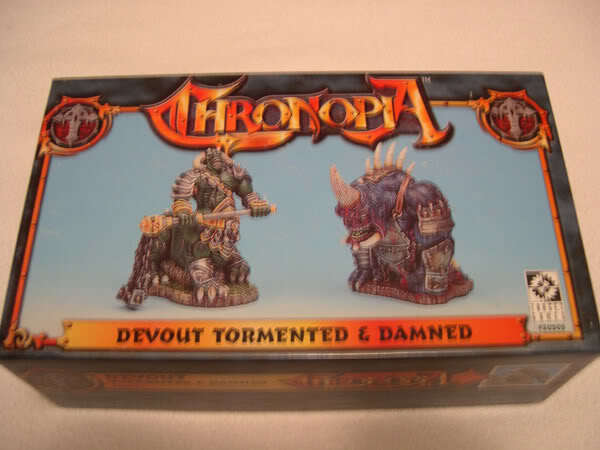 Chronopia Devout Tormented & Damned box. This is the boxed set he came from. 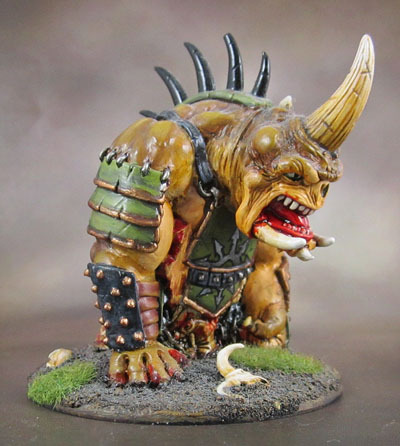 Along with a very Dragon Ogre kind of model – the Damned. Both are mostly resin with metal detail accessories. Unfortunately, they’re the resin of the time, so don’t expect something like McVey or Mierce’s stuff here. The resin is “drop-cast”, like Scotia Grendel’s scenery and while the Tormented here is fine due to his design, but all of the space underneath the Damned’s torso is filled, and you’re kinda expected to paint it black etc and try not to notice it. I suspect that the resin components of this kit might have even been outsource-cast by Grendel. Great Unclean One, Plague Marine, Devout Tormented Daemon Prince. A group shot with the Plague Marine Sergeant shown recently, to give a sense of scale for the two models. Not huge by today’s standards and more recent models, but they were both big for their time, and I think retain a lot of their presence simply by being cool models. 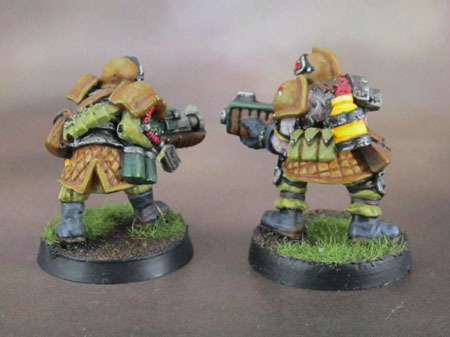 Nurgle Lost and the Damned – Army Shot! – Click to embiggen. Ahem. Back to painted models. The first one of these guys was shown years ago, but he’s being reshown here in the context of this LatD army which he’s a part of. Once I work out a proper list. 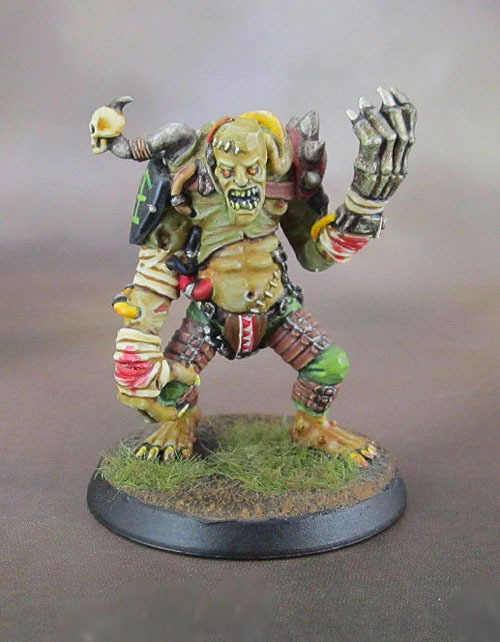 Spawn of Demnogonis as Nurgle dude. Big Mutant? Herald of Nurgle? He’s a Spawn of Demnogonis from the first edition of WarZone. 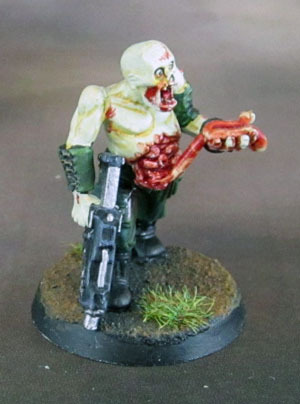 The stitching and bandages make him thematically suitable for a Nurgle force, and the model looks to be suitable for perhaps a 40k Hearald of Nurgle or a Big Mutant directly from the LatD list. He’s mounted on a 30mm base from some brand of semi-soft plastic prepainted figures that was available in the 1990’s. WarZone Carnal Harvester. 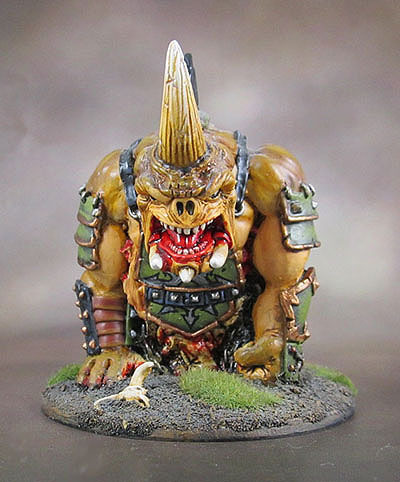 He makes a great Big Mutant or Chaos Ogryn for Lost and the Damned forces. He’s not an especially Nurglish model, but he’s been painted to go with the Kitbashed Cultists from the previous few posts. Though without a wood-grain finish on his weapon. Big Mutant Family (and scale) shot! And a little group shot. 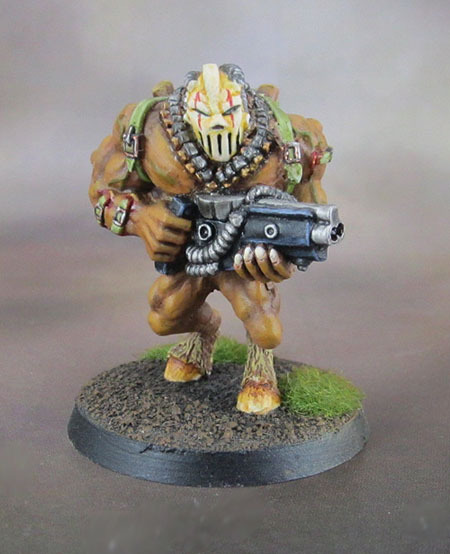 I’ve got another half-painted WarZone figure (Gomorrian Emasculator) somewhere that will make another great Big Mutant/Chaos Ogryn if I can find it and finish it, as well as quite a few others that are entirely unpainted. 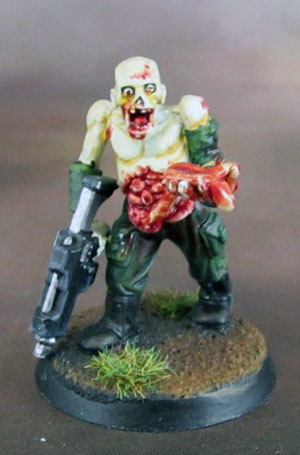 Warzone Dark Legion Blessed Legionnaires as Nurgle Zombies. Or Poxwalkers. 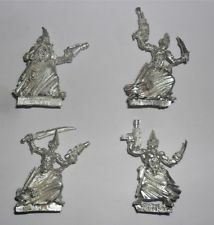 Or Chaos Cultists. 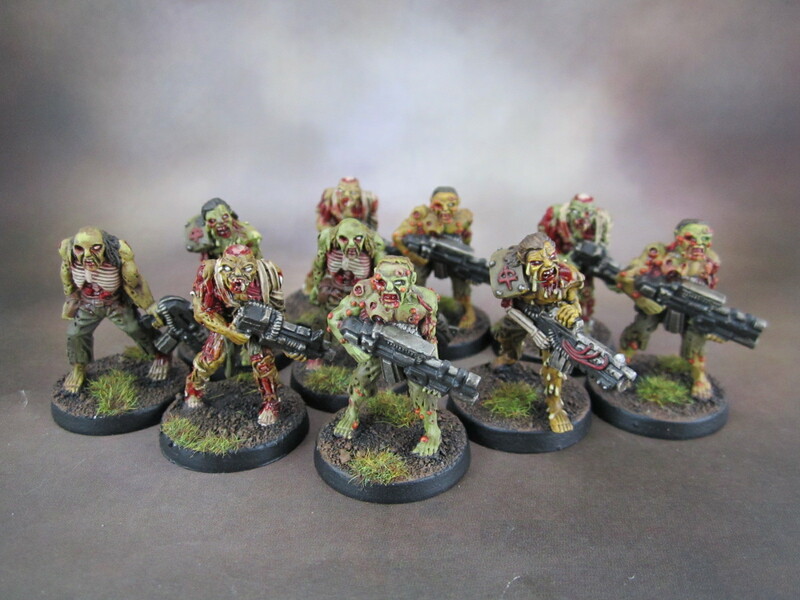 These models are actually Warzone 1st Edition Dark Legion Blessed Legionnaires, to be used as Nurgle Plague Zombies in one form or another. I showed them off last year, but the photos weren’t the best, and so I took a new one as part of the Lost and the Damned force I’m showing here (and seeing what I have ready to run and what’s started and part-painted while I do it). 11 More Warzone Dark Legion Blessed Legionnaires. …like these guys that I’ve just found. They’ve been spray primed and are now going into the paint queue to be part of this army. 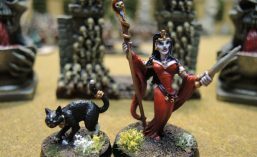 This is the final post of the triptych that deals with my little batch of cultists. 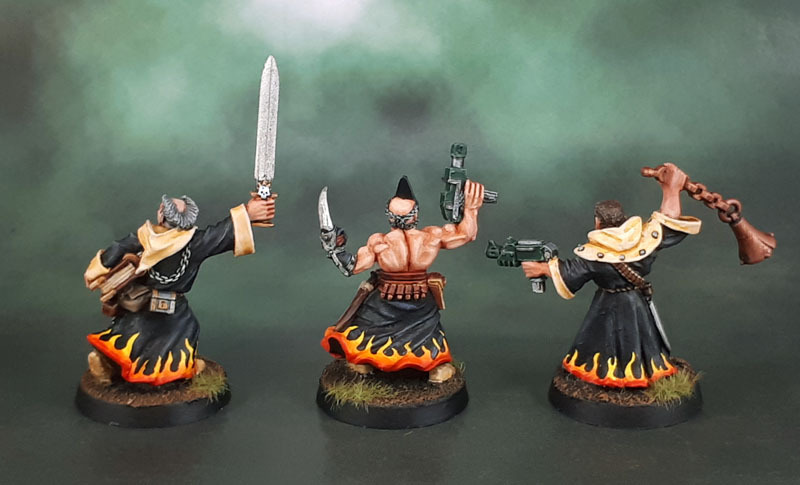 It’s probably worth pointing out at this point that at the time I kitbashed these guys, the only cultists that GW had produced were these guys, nice enough figures, but a mere four sculpts which I also believe were also well out of production by then. 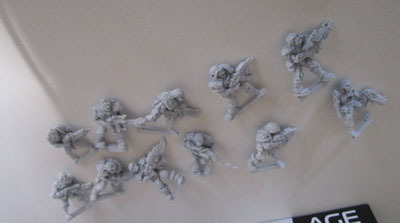 They had also released a “mutation sprue” that was sold in a bundle with plastic Catachans and other stuff as a “build your own” solution for Chaos Cults and LatD armies. This was also long before Forge World stepped up to the plate with their own designs. The smaller of these two guys are pretty straightforward. More kitbashes from the Catachan and Chaos Marauder sprues. 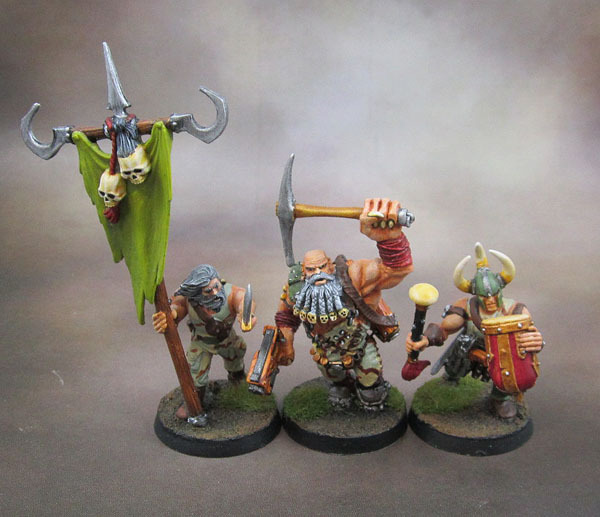 The big guy in the middle was originally a metal Ork Nob that had been an unfinished conversion into some kind of DiggaNob prospector hero (from GorkaMorka) by (I believe) a GW Melbourne Staffer. I somehow ended up with it through sale or trade. 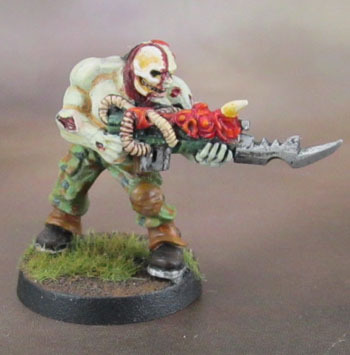 He originally had a shovel, which I swapped out for as “normal” looking a pistol as I could find from my own Nobz. I thought he looked just the part for the leader of a Chaos Cult. Over-bulked up? Fingernail-talons on the end of his fingers? Skull-beard-braids? It all works. I added the chaos-style plastic plasma gun and its sling (I must have had Necromunda in mind actually – I always gave my leaders a Plasma Gun!) As always, cheap-looking plasticky “wood” panelling for the weapons. Rear View, with the plastic-wood panelled Plasma Gun. The Banner I kept completely plain. 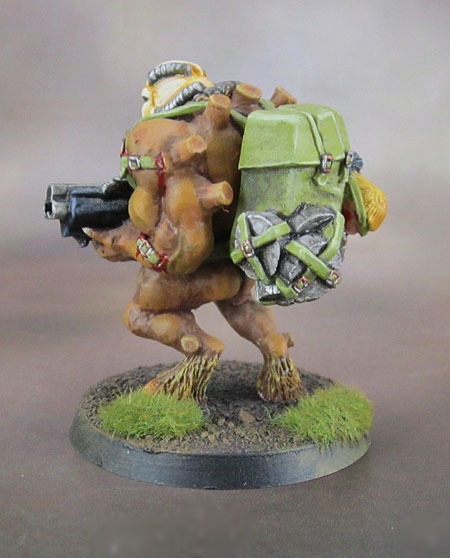 Green adds a possible implication for Nurgle, as do the brown and green tones of their clothing, while also not tying them to being only used as one-trick ponies of Nurgle. 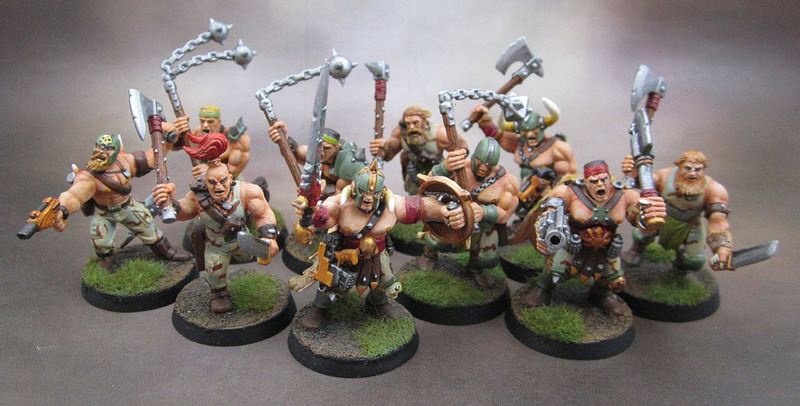 The Big “Gang” Shot of The Viking Muscle Power Gym Militia. Click to Embiggen. And finally, the money shot of all of my cultists. 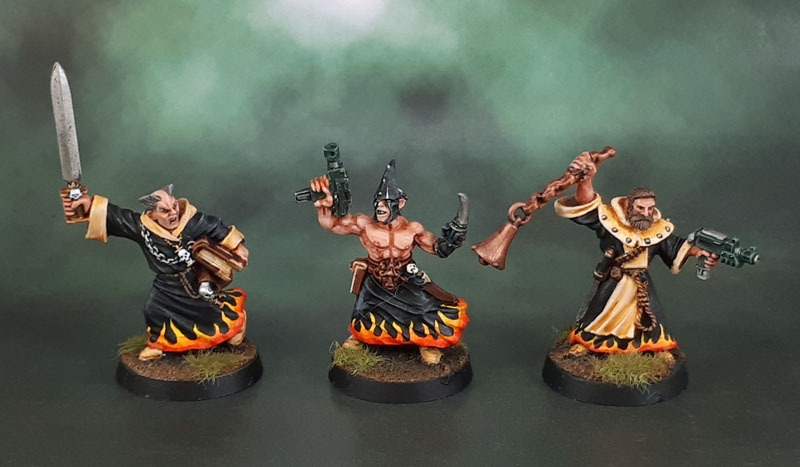 I’ll undoubtedly paint up more cultists at some stage, but they’ll be a different batch and style to these guys. 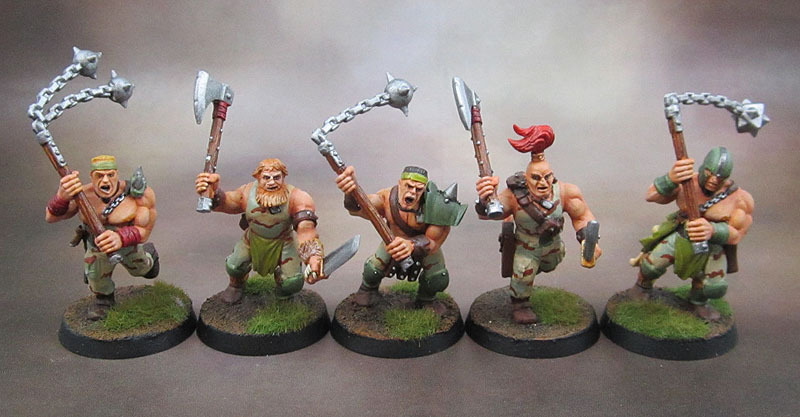 On one hand I’m somewhat tempted to revisit these guys and add a ton of tattoos and some satin and gloss varnish to represent sweat and oil, but on the other hand, they’re done, have been done for years and I’m still happy with them – no purple pants on Orcs that need to be repainted here! So I think I’ll leave them be and move onto other figures that actually do need to be touched up – and of course – completing and painting entirely new models. 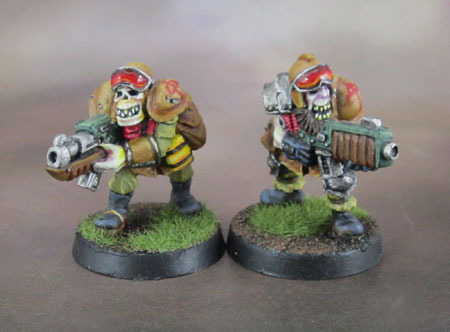 The paint scheme on these guys (3-Colour US Desert Camo, plastic-looking, pseudo-wooden weapon furniture, etc) is pretty much exactly the same as that of their rifle-toting brethren, which makes sense since these were kitbashed and painted together. These guys got a couple with fur capes/pelts, which is to distinguish the Leader of the Pack (sing it!) and his second. 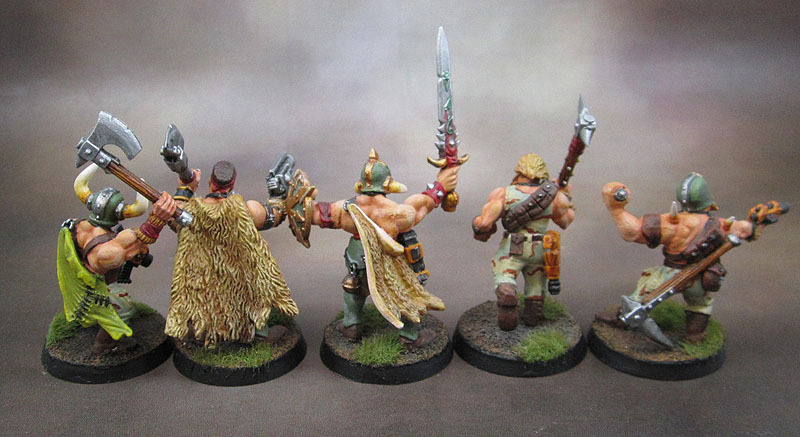 Rear View of the Cultists. Swinging those things around in tight formation seems safe. What? The “other half” of the squad, though in practice on the table top they’d all be mixed in together anyway. 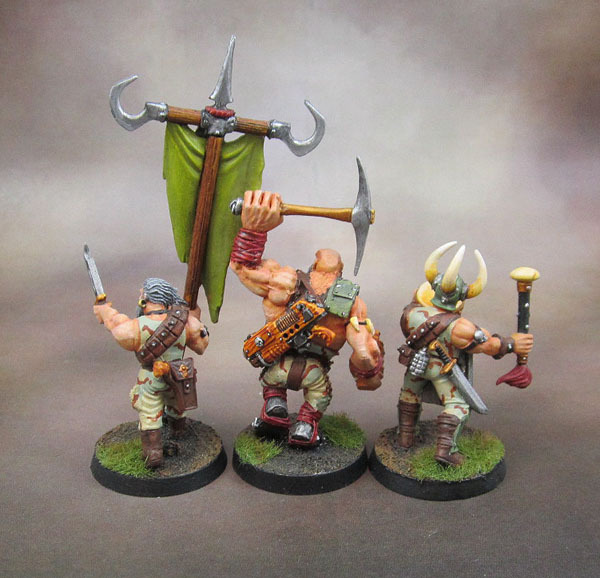 I wonder if I could use this squad in Kings of War without anyone noticing? I removed the horns from the one guy’s helmet both for variety and for common sense. GW-sized “viking” horns and a flail is a clear OH&S-violating combination that’s just asking to end up in traction on Cultist’s Worker’s Comp. As before, the rear shot shows off some of their additional gear, including their collection of pistols, both archaic and newer looking. And some longbones. Gotta love that Kroot Accessory sprue! A Clowder of Close Combat Cultists. Here’s the usual squad shot. 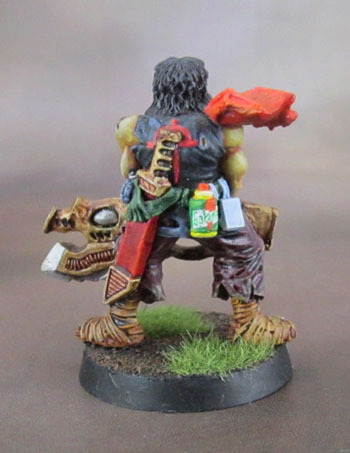 This half of the group is what really makes them into a feasable Necromunda Gang – using Goliath Rules, naturally! Though as noted, there’s lots of scope to use them as all kinds of generic bad guys and nutters.